Una peligrosa organización tiene en su poder dos proyectiles nucleares que harán estallar si no se cumplen sus deseos. 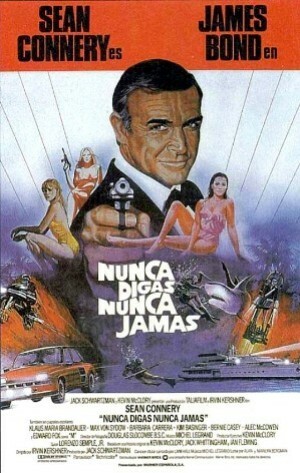 James Bond evitará el chantaje solucionando el problema. Sean Connery, Klaus Maria Brandauer, Max Von Sydow, Barbara Carrera, Kim Basinger, Bernie Casey, Alec McCowen, Edward Fox, Pamela Salem, Rowan Atkinson, Christopher Reich, Valerie Leon, Sylvia Marriott, Lucy Hornack, John Stephen Hill, Milow Kirek, Paul Tucker, Roy Bowe, Gavan O'Herlihy, Tony Alleff, Joanna Dickens, Jill Meager, Billy J. Mitchell, Dan Meaden, Ronald Pickup, Anthony Van Laast, Robert Rietty, Manning Redwood, Derek Deadman, Prunella Gee, Anthony Sharp, Brenda Kempner, Saskia Cohen Tanugi, Wendy Leech, Vincent Marzello, Guido Adorni, Michael Medwin, Pat Roach. Irvin Kershner (Dirección), Douglas Slocombe (Montaje), Lorenzo Semple Jr, Jack Whittingham, Ian Fleming, Kevin McClory (Guión), Michel Legrand (Música).